ESL - English Exercises: Food Items - What food does Vinnie the cow like? food exercises > Food Items - What food does Vinnie the cow like? Food Items - What food does Vinnie the cow like? 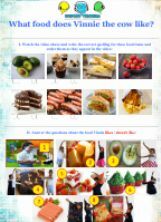 An activity based on my video "The cow cake" to practice the meaning/ spelling of difficult to write food items and expressing likes/dislikes for both - a third person and first person in Present Simple. This is soo great!!! Not kidding, I´ve never seen something that wonderful before! Believe me, that is just an extraordinary gorgeous exercise!! Keep doing such a fantastic job as it is mind blowing!! Abigail, a fan of your work! Ps: Please my dear keep me inform of your new releases!! And do other wonderful online exercises! You´re new here so... Welcome to the eslprintables family!! Ps: Seriously guy, seriously?!! You´re new?! This is the first exercise you create?! Seriously!!! You´re just sooo incredible sweatie!!! !